This cartoon is based on a horrible evening I had in Brooklyn in the company of my friends "Mimosa" Sam and Dean Haspiel (creator of the comic book Billy Dogma). We all went out to a claub called Black Betty's, a bar and dance club full of beautiful young New York women. Sam is a legendary womanizer--one of those guys with a tallly in the upper double digits--and Dean is a very rugged, manly-looking guy, and before long Sam had snuck off to the bathroom with some woman to bury his face in her breasts and Dean was in earnest conversation with the most beautiful girl in the bar, who'd been sitting imrpobably alone with a glass of wine, writing a letter. I meanwhile sat with my empty beer glass getting grumpier and grumpier. I felt like the fat girl. Sam and Dean were the pretty girls, and I was their fat friend who they'd brought along because they felt sorry for me. I know this is a pretty self-pitying cartoon and I want to say that I know I'm not like the Elephant Man or anything; I've just never understood how guys pick up strange women in bars like that, and I got a little jealous and resentful and this is all I got out of it. 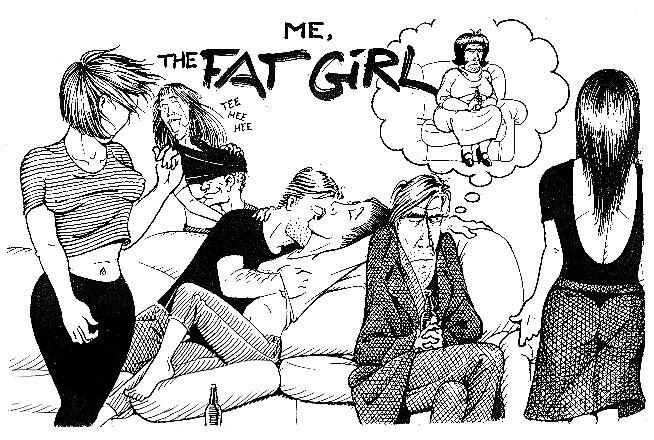 The only really funny thing about this cartoon is the drawing in the thought balloon of me as the fat girl. At first I'd drawn an actual fat girl, with sort of a sad, wistful, resigned expression on her face. I felt awful for her. She depressed me. It wasn't until the last minute that I realized it had to be my face on the fat girl's body. I added a bouffant and a heartrending little bow on top. In each of us--no matter which gender we are, no matter how thin, or attractive, or confident--there is a fat girl.